Still carefully cake building this new JoeGoat pipe. Setting it down whenever I suspect it may be getting too warm. Still tamping only the center and relighting the outer tobacco that gets rolled up. Its really cool how this is working, seeing the ring of embers at each relight, and the cake building evenly all the way down the bowl. Have we seen that pipe before or do all of your pipes look the same? I have 3 that are all that Scoop shape. This is the third, and largest. She's a beaut, isn't she? I haven’t seen it enough times to commit, but that Birdseye does look good. JimVH should like this Tilshead Dublin. Larger chamber than I usually prefer, but smokes well. I have not determined what Mr. Jones saw to keep this one from being graded. This was a Christmas gift. Very light and easy to clinch for extended time. It is from Savinelli's "hand made" line with which I am not familiar. Both pipes are beauties, judge. Yes, they are very nice, but no puppies. Not a single one that I can see. Saddened by that. I would get a magnifying glass to search more closely but I prefer not to. Goose fouled (fowled?) up the vortex so his comment appear to be yours. I'm waiting for my boy blue to drop the price on this Pete I've been scoping out. So you’re saying Goose is responsible for the deep freeze? I was wondering who fouled up the vortex. 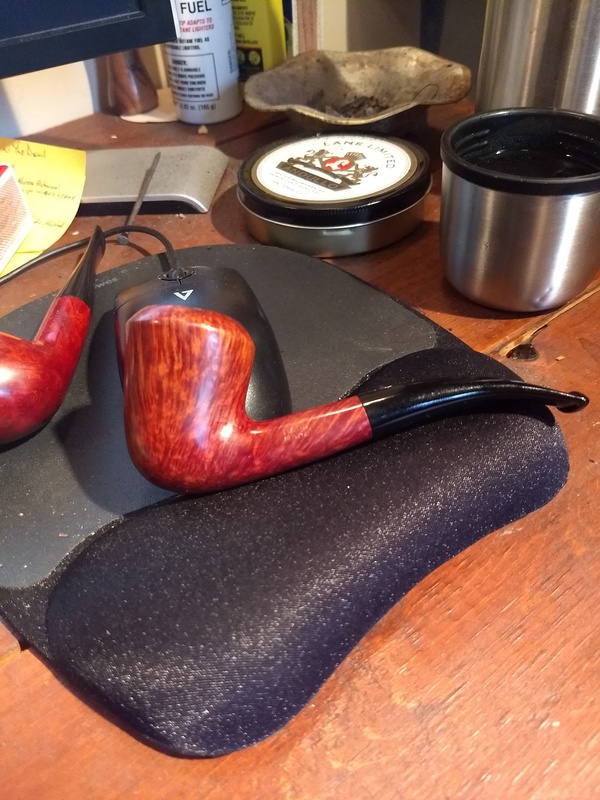 The mailman delivered my Savinelli Tortuga Smooth 614 today. I bought a Roma last week and loved that thing, so I ordered this one. 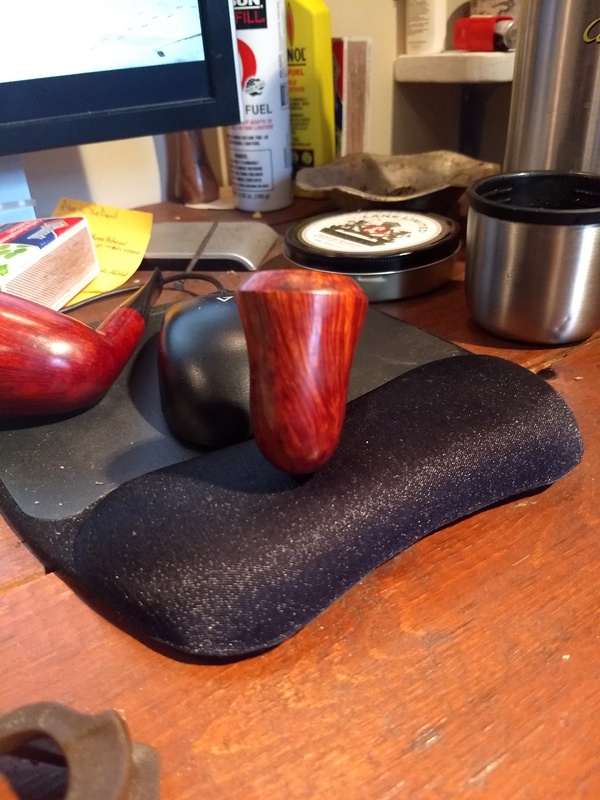 It's not my usual style of pipe shape but it's working out real well so far because I like a little bowl smoke in my face. I'm breaking it in with Pirate Kake right now. It is strange but neither the Romo or this pipe seem to really need breaking in. I really like it. Nice Stanley. Most all my pipes are full bent. Enjoying my Bones lovat so much, I ordered a second one this morning. The rough cut from the block of the most recent pipe JoeGoat made for me. Joey must have used a wide angle lens, up close, making the beginnings of the pipe look enormous. It's resting on his knee. Below pic is the finished work. Pipe ablaze in flame grain. A gentleman and brother in Christ from Maine who I met on Facebook knew that I had expressed interest in one day owning a Stanwell 11. As it happens, he collects Stanwell 11's, and he offered to send me one of his in a trade. I sent him a tin of Aperterif and 2 tins of EMP (his all-time favorite blend) and he sent me a well smoked Stanwell 11, along with some 1979 Half and Half, and a H. Upmann cuban cigar that he picked up at the duty free store at Heathrow while on a recent trip to England. The pipe has some rim darkening, and is well-traveled - the note included declared "That stanwell has a hundred thousand miles on it. Been refurbished twice, been on 3 continents, back packs, glove boxes, suitcases, wool coat pockets in the arctic circle. and never had an aromatic through it. It's a traveling pipe, enjoy it in good health, take it with you." It still has the original stem, and it smokes great. The weight distribution is nice - it clenches easier than I thought it would. 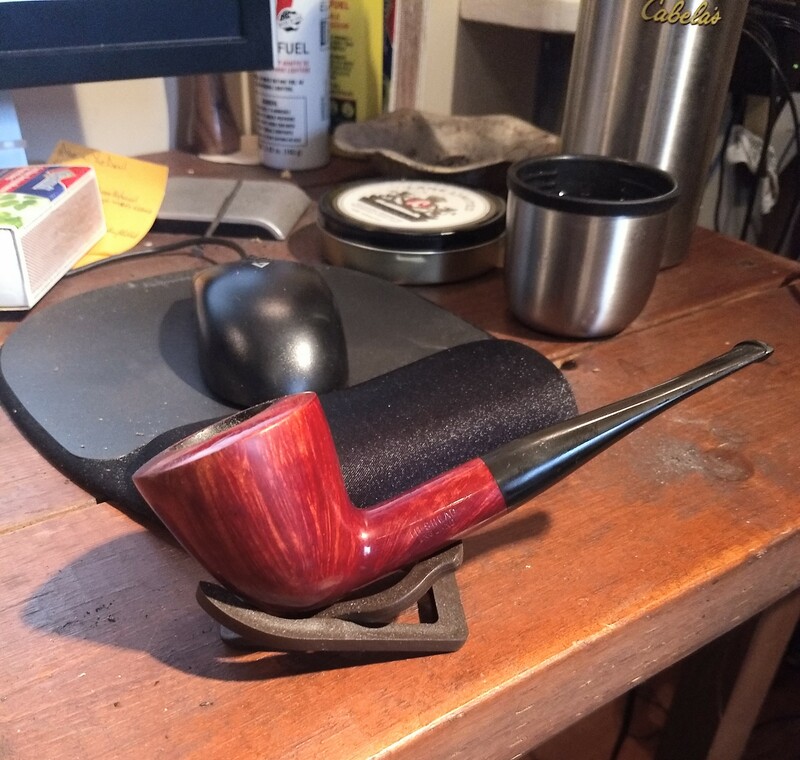 I think this will join my Peterson 106 and the Rattray's Beltane's Fire rhodesian (which I lovingly refer to as "The Precious") as a favorite pipe. I wonder why Stanwell doesn't seem to produce many 11's any longer? I suspect that given some time I may seek to acquire another of this shape.